“Choosing religious life is not just a one time choice. In fact, the choice of a life of commitment is a decision that must be made over and over again as you face life’s realities. You need to remind yourself that you are being called to a deeper place within yourself where you can experience the presence of God,” said Sister Joan Winkler. You might suspect that after hours in their Bowling Alley, many of the family became experienced bowlers. During WWII they even made up a team so they would not lose some business. “My highest score was 250; I threw a power ball with a strong right arm-nothing fancy. I always aimed at the 1 and 3 pocket,” she admitted. During her junior year, Sister Joan entered religious life as a Hospital Sister. One memory of her second year novitiate is that she liked to use free time by getting water samples from the Motherhouse Lake and looking at the water under a microscope to observe the micro organisms in it. This interest in science was reflected in a paper she wrote for a nutrition class and, to her chagrin, led to her being selected to study dietetics. “Mother’s advice to keep your word and faith in God’s presence in obedience helped me to accept this direction for my life,” Sister Joan said. Upon making her First Profession as a Hospital Sister on October 4, 1953, she continued her education by earning a bachelors degree in dietetics from Fontbonne College (St. Louis, MO) and completing an internship in dietetics from St. Mary’s Hospital (Rochester MN). She served briefly as a dietitian at St. Joseph’s Hospital (Highland) and St John’s Hospital (Springfield) followed by serving as Director of Dietary at St. Elizabeth’s Hospital, (Belleville) from 1958-65. After a short time as the Assistant Novice Mistress at the Motherhouse, Sister Joan was assigned to Sacred Heart Hospital (Eau Claire) from 1966-71 as the Director of Dietary. From May 1971, she served as the hospital’s Assistant Administrator and served as the Executive Director and Administrator from October 1973 to August 1974. “My grade school teacher considered me a leader despite the fact that my deportment grade often indicated that I was ‘inclined to mischief’. Over time, the philosophy that I learned at Fontbonne began to influence the way I thought things through, and the time in formation at the Motherhouse enkindled an interest in psychology and a desire for further education. My superiors suggested that I pursue my master’s degree in health care administration, and so I enrolled at the University of Wisconsin (Madison) where I became fascinated with Economics, which began as a branch of Ethics, and in Organizational Behavior where I focused on the ways that values are incorporated into corporate decisions. I graduated in 1976,” Sister Joan said. She continued to live and work in Madison until 1986 where she served as the President of the Catholic Health Association of Wisconsin. Sister worked briefly in Chicago at Alverna Home Nursing Center, at which time she earned a masters degree in pastoral studies from Loyola University and a certificate in Spirituality from the Institute of Spiritual Leadership. 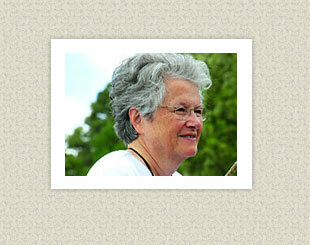 Always interested in people and their spiritual development, she returned to the Motherhouse in 1988 to serve as Program Director at the Franciscan Apostolic Center until January 1992. “I then had the opportunity to serve as a live-in manager at Manressa House (Florissant, MO). The House provided assisted living for senior women,” she said. Sister Joan served as Provincial Councilor from 1995-99 and Provincial Superior of the American Province from 1999-2007. Presently, she serves at St. John’s Hospital in the People Services Department as a reflector and mentor for the hospital’s journey to excellence. “You must have self knowledge. Know who you are and where you’re going and inspire others to follow. Trust that God will direct you if remain true to your word and God,” she concluded.